From the original Arthur Conan Doyle stories to BBC’s Sherlock, the character Sherlock Holmes has always been lauded for his ‘science of deduction’. But is that what he does? Picture Sherlock — a regal, brilliant obsessive-compulsive high on the drug of puzzles — snooping around a crime-scene, collecting his information. He observes countless details about the scene and the victim (many of which the police seem to have overlooked) and then from that information arrives at a conclusion that is not necessarily true, but is probable based on the information available. So why is he known as a master of deduction? Deductive reasoning is also known as ‘top-down’ logic, where the reasoner begins with an accepted premise and seeks to prove another statement based on previously “known” information. 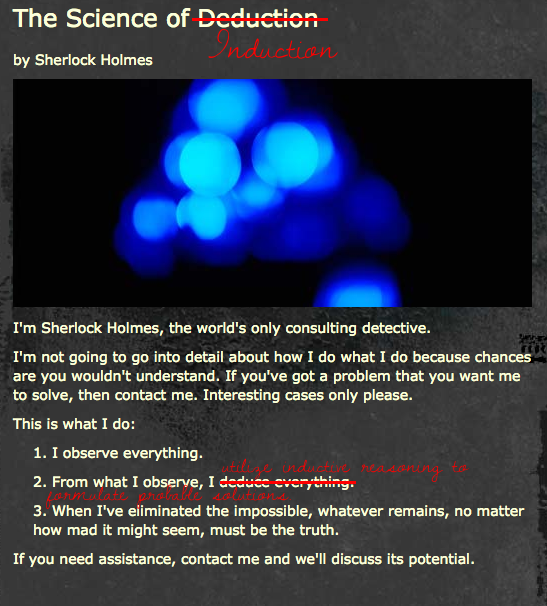 An example of this might be: Sherlock walks into a dank bedroom with the premise that there have been a rash of murders in this area, so the woman on the floor is likely another victim of that same predator, and then he gathers information — blood, nicotine stains, ash in a corner, a fragment of glass — and narrows the scope of that available information until his premise is the only logical conclusion remaining. This is the kind of logic that, in fact, many of the police in the Sherlock Holmes stories (and our modern world) use; they have a suspect in mind based on previously available information that is not necessarily related to the case, and then they seek out evidence to prove the guilt of that suspect. It’s been proven over time to be a useful tool in crime-solving and law enforcement, but it sure doesn’t seem like the Sherlock method. Inductive reasoning, however, allows Sherlock to extrapolate from the information observed in order to arrive at conclusions about events that have not been observed. Here, we see the intrepid detective walking into the scene a blank slate; he has no pre-supposed ideas about what may have taken place. Maybe the woman on the ground died of natural causes, maybe she was murdered, maybe she fell through the ceiling from an airplane flying thousands of miles above. He simply doesn’t know. So he looks. There’s the ash from her cigarette, so she couldn’t have fallen from a great height. There’s the glass from a broken window, but this might have already been broken when she arrived, or it may have been broken in a struggle. Does she have lacerations? Is her dress damp from the rain outside or dry? And he goes on to gather information until he arrives at a conclusion — that still may be incorrect. And yet more information will come and come until he is quite sure he’s arrived at the right conclusion. Now, technically, Doyle’s stories use both inductive and deductive reasoning, but I would posit that the skill that makes the character of Sherlock Holmes famous (and differentiates him from the detective inspector) is his ability to use inductive reasoning. That, and his extensive catalogue of facts to help him make leaps with his inductive reasoning that others might not be able to conceive of. So how could Sherlock Holmes — whose extensive mind-palace houses of hundreds of varieties of tobacco and the locations that different weights of paper are produced throughout Europe—make this error when describing himself? Was it, in fact, his scribe’s error (though Watson was a doctor and should have known the difference between deductive and inductive, and Doyle, too, should well have understood the difference)? Is the misuse of ‘deductive’ absent-minded, explained by Sherlock’s ignorance of other ‘commonly known’ facts that are too basic to be of use in his puzzle-solving? Or is the ‘mistake’ intentional—convincing those who skim these stories without truly paying attention to detail to begin using the form of reasoning that the detective inspectors are constantly getting tripped up over? Without further evidence, the world may never know. Not inductively, anyway.